Like Freedom of Religion and Freedom of Speech, in the United States the concept of Freedom of the Press as it developed has been uniquely American. Along with free speech for the general population, it is surely the source of what has become known as American Exceptionalism. 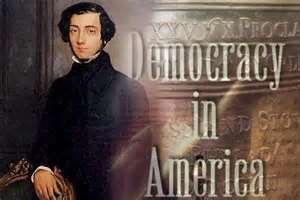 Alexis de Tocqueville originally referred to the United States as an “exceptional” country in 1840. His references and analyses dwell on many special aspects of the American situation regarding location and resources, driving the people to practicality over art or science. The phrase “American Exceptionalism” actually was coined in the 1920’s by Joseph Stalin in a dispute as to why the United States did not fit with the Marxist view of history. Though it is often referred to as a source for the American Bill of Rights, the English Bill of Rights of 1689 made no provisions for freedom of the press. There was a long history of licensing of the press in England. It had been done by kings. With the rise of Parliamentary sovereignty, it was done by Parliament dating from 1643, with provisions for pre-publication censorship of the press. 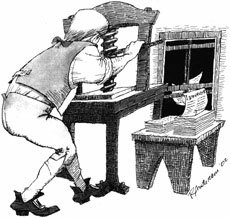 Besides licensing laws that gave the English government control over who could operate a printing press, as respect to the government, there was the common law crime of seditious libel. A seditious libel was a printed statement that “brings into hatred or contempt” the monarch or heirs, or the government, or the administration of justice. Seditious libel also included incitement to people to change any matter of Church or State established by law (except by lawful means), or the promotion of discontent among British subjects. The potential penalty for printing such material was life in prison. The exceptional American concept that a free press was a necessary element of representative government was not borne of English tradition. 1 Every individual is sovereign over his own person with natural inalienable rights. 2 People join together and form governments to protect those rights. 3 Management of government of a large society is best done by representation and granting limited power to the government for the purpose of protecting rights. 4 Ultimately the individual through his representatives retains sovereignty over the government. 5 As a sovereign, the individual remains equal to his representative he retains a freedom of speech equal to the representative. 6 In a small community, an individual is likely to know his representative and have the ability to make informed electoral decisions. 7 As communities grow ever larger, and elected officials represent more people, having personal knowledge to make informed decisions regarding representation becomes more difficult. 8 The dissemination of knowledge among large communities is best achieved by a free and open press. 9 Freedom of the press is an institutional necessity to achieve a properly representative government. This was an exceptional doctrine and the basis for American Exceptionalism. It was not the result of Americans living on the frontier as de Tocqueville described. It was the result of the underlying philosophy that served as the basis for America. 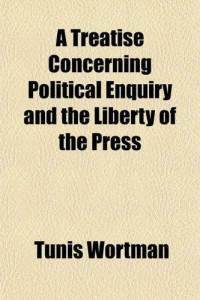 Tunis Wortman’s A Treatise Concerning Political Enquiry, and the Liberty of the Press. Wortman, Madison, Jefferson and others expounded on the First Amendment’s intended broad press protections, and the unconstitutional nature of The Act. During the next two years 25 people were arrested for publishing statements in violation of the law. Eleven went to trial and ten were convicted. The Act was the central issue in the election of 1800. John Adams and the Federalists were thrown out of office. Thomas Jefferson became president, and pardoned all those convicted under the Act. The American people by virtue of their vote had found the Act unconstitutional. The first case involving press freedom came before the US Supreme Court in 1931. In Near v. Minnesota, and overturned a Minnesota law that classified certain types of publication as a nuisance. Since then, the Court has consistently placed a high premium on press freedom, with jurisprudence consistent with the writers of 1798-1800. The Supreme Court’s cases, from Near to NY Times v. Sullivan to the Pentagon Papers, have been very solicitous of the rights of the press. The court has recognized the press function in a free republic to be critical and given institutional protections that recognize the press as almost a fourth branch of government. These protections are philosophically in line with those of Madison, Jefferson and the opponents of the Sedition Act of 1798. When people speak of “American Exceptionalism”, it is most often in reference to ideas such as “Manifest Destiny”, the conquering of the West, “The Monroe Doctrine” and other historical matters which have brought the United States to a position of world leadership. Even de Tocqueville’s references were related to “practicality” and the American frontier. These thoughts miss the point. The basic element of the exceptional nature of America is the philosophy of individual sovereignty that leads to principles like “Freedom of the Press”. It is that initial principle that leads to all else. Leaders like Ronald Reagan and Newt Gingrich have employed the phrase to denote America’s special place in human history. It is the idea that an individual is naturally sovereign, with a right to censor the government and not the reverse that was truly revolutionary. It did not matter if the statement were true. In fact, true statements which brought hatred or contempt to the government were likely to receive worse penalties. Truth as a defense to seditious libel originated in the colonies in the trial of John Peter Zenger in 1735. His attorney, Andrew Hamilton of Philadelphia, argued directly to the jury that what Mr. Zenger had published about the colonial governor was true and Zenger should not be convicted. Despite truth not being a defense for Mr. Zenger in 1735, the jury found him not guilty. The Zenger trial left a large legacy. It set the stage for truth becoming a defense to charges of libel. It proved the importance of juries as protections for citizens from the government (juries are mentioned five times in the original Constitution and Bill of Rights). On a lighter note, Mr. Hamilton did such a fine job for Mr. Zenger, the trial gave us a phrase remaining in use today: “Philadelphia lawyer”. Nor traditions elsewhere, since other references to press freedom in other countries were at the sufferance of the sovereign. The Virginia and Kentucky Resolutions opposing the Act and putting forth theories of Nullification were authored by Madison and Jefferson respectively. The court did address free speech issues earlier in the matters of Abrams v. United States (1919) and Debs v. United States (1919). These matters did not directly involve the press, but individuals. They did uphold provisions restricting speech in the Espionage Act and its amendments involving sedition. It is unlikely those provisions would be upheld today given the development of speech law since, but in the “terrorism” atmosphere that exists in the early 21st century, prediction is difficult. Holding that public officials suing a press publication for libel must prove “actual malice”, a very high standard protecting most publications from suit. Holding that the government may not get an injunction to prevent publication of materials by the press, even if the government alleges issues of national security.